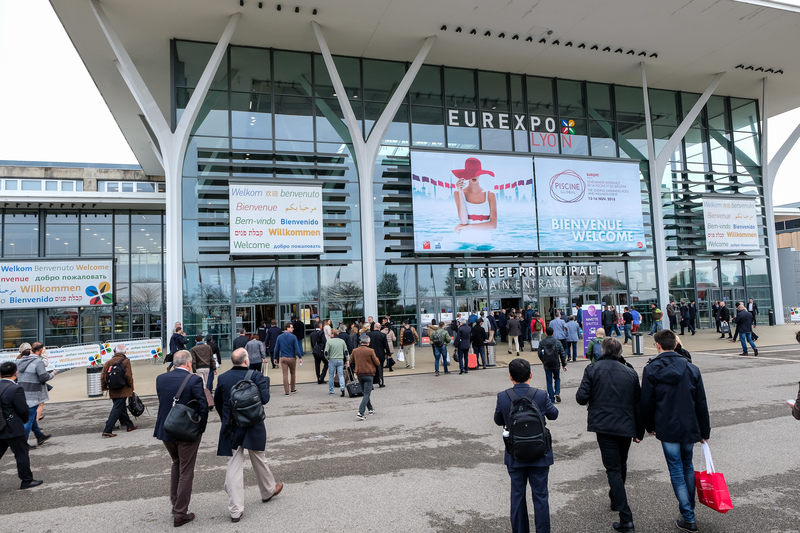 Piscine Global Europe organisers have proclaimed that the 2018 edition has been a resounding success with visitor numbers increasing by over seven per cent compared to the previous outing of the international exhibition in Lyon. Official figures have revealed that a total of 19,845 visitors flocked to the Eurexpo venue during the four-day wet leisure and wellness showcase, which had a strong contingent of hot tub and swim spa exhibitors among a large list of swimming pool product specialists promoting their products to the French and international audience. Once again the international presence of the exhibition was very strong with 65 per cent of the 629 exhibitors coming from outside France, while 42 per cent of the surge in visitors this year were from other countries. Among the leading European exhibitors extending their presence in the thriving hot tub and swim spa markets were WhatSpa? Best Buy Award-winning and WhatSwimSpa? Best Buy Award-winning brands Aquavia Spa, Villeroy & Boch, and Wellis. On the Covana stand Aqua Warehouse Group chief Richard Hart and his team, which distributes the WhatSpa? Best Buy Award-winning and WhatSwimSpa? Best Buy Award-winning American Whirlpool and Vita Spa ranges, promoted the fact that the Essex-based wet leisure product specialist that runs Aqua Spa Supplies has now gained the European distribution status for the automatic cover system. The exhibition’s strong focus on swimming pool lifestyle, design and innovation, though, reflected the thriving demand for pools in France, with 15 per cent of French households now equipped with one, and the sector’s turnover having increased by more than 30 per cent in the three years up 2017, when it exceeded two billion euros. Aquilus has been a constant presence on the exhibitor list since the inception of the event and Managing Director of the pool and spa specialist company Xavier Fourel highlighted that the visitor numbers had been increasing over the years and that the company had once again utilised the showcase to increase its contacts. “We have been taking part in this exhibition since the start,” divulged Xavier; “We are a member of the Majors Club, and we remain loyal to this event. It gives us an opportunity to meet our industry colleagues regularly and to expand our network. Platinum sponsor of the event Zodiac reported that it had gained new contacts and Alexia Petitjean, Zodiac’s Marketing Manager for France & Export, revealed that networking had enabled the company to generate prospects from outside of France. “This year again the exhibition was a real success for us, with many visitors and highly qualified leads as usual,” said Alexia. Gold sponsor of the event Hayward showcased its new AquaVac 6 Series model during the exhibition and the company’s Marketing Director for Europe Claire Point highlighted that the feel good factor from those in attendance was high and that international visitors were reporting very positive levels of optimism. “Piscine Global Europe 2018 was a very successful show for Hayward,” said Claire; “We were able to present our many new products and innovations that will be launched in 2019, in particular our new AquaVac 6 Series robot. Piscine Global Europe Managing Director Noémi Petit revealed that 20 international federations also made the trip to Lyon for the Pool Summit during Piscine Global Europe; while international delegations from Brazil, Greece, Israel and Senegal also attended the exhibition. Around ten Ambassadors who represent the exhibition around the world were also present. Noémi thanked exhibitors for their continued loyalty and reported that the organising team were delighted with the support from within Europe and around the world for the wet leisure and wellness showcase, as well as the high level and quality of visitor numbers. “I’m delighted with this edition of Piscine Global Europe,” said Noémi; “Both from a commercial viewpoint, with very high satisfaction regarding the calibre of visitors, and in terms of the atmosphere at the exhibition, with lots of fruitful discussions and networking. “The business climate is strong. I also see a new area of focus developing around the pool renovation sector. The market trends that stood out during this year’s show concern renovation, but also feature-packed small pools and wellness products proposed as add-on sales.